JVC GZ-HD620 HD Everio Hard Drive Camera is a high def camcorder that packs in up to 50 hours of recording to its 120GB hard drive, with room for even more storage when using optional microSD/SDHC memory cards. Among its many other features the camera provides you with 24Mbps AVCHD bit rate recording for capturing highly detailed, sharp images, and JVC’s Super LoLux which captures clear footage in low light situations using a back-illuminated CMOS sensor. At the core of the GZ-HD620B is the aforementioned back-illuminated 1/4″ 3.3MP CMOS sensor. This sensor works together with the Konica Minolta HD lens, 30x optical zoom, and JVC’s Advanced Image Stabilizer to help you create brilliant video and still images. To transfer JVC GZ-HD620 HD videos to Apple hard drive, you can use the Apple iMovie, Final Cut Pro. But you shall make sure that you at least have iMove 8 or iMovie 9, FCP 6 on your Mac with Intel processor. However, if you have iMovie 6 or first copy AVCHD files from camera by looking for PRIVATE -> AVCHD -> BDMV -> STREAM on SDHC/Micro SDHC card, or copy MTS file from AVCHD -> BDMV -> STREAM on built-in HDD, you may find it difficult to import to iMovie, FCP, or even Avid MC 5. UFUSoft AVCHD Converter for Mac is the perfect Mac AVCHD camera converter that it helps you convert JVC GZ-HD620 MTS to MOV for editing on Mac. With the 3 steps below, you can import JVC GZ-HD620 HD videos to Avid, FCP, FCE, iMovie for editing. Step 1. Load JVC GZ-HD620 MTS video to UFUSoft AVCHD Converter for Mac. Run UFUSoft AVCHD Converter for Mac as the JVC GZ-HD620 Avchd Software for Mac, and click the “Add” button to load 1080p mts videos. 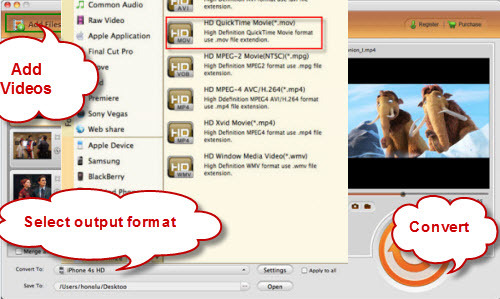 Click the “Format” option, and choose HD Video > HD MOV-QuickTime (*.mov) as output format. The Mac JVC MTS to Avid converter convert JVC GZ-HD620 MTS to H.264/AVC MOV for Avid Media Composer, Final Cut Pro, Final Cut Express and iMovie. Step 3. Transcode JVC GZ-HD620 AVCHD to HD MOV for Avid MC/FCP/iMovie. Click the convert button under the preview window, and the JVC GZ-HD620 MTS to Avid Converter starts converting 1080p MTS to HD MOV for Avid/FCP/iMovie/FCE on Mac.